What do I enter in the Registration form? Why is the Activation button not working? Did you open the form using Acrobat Reader DC? Check the text at the top left of the page when the document is open and you should see “SEC Registration.pdf – Adobe Acrobat Reader DC”. Click the Start button on your task bar (usually found at the bottom left of the computer screen). If you don’t have Adobe Reader on your computer, you can download it for free here. Adobe may suggest installing software from other companies along with Reader. Usually you do not want or need those, so uncheck them unless you’re sure you want them. If you use PDF products apart from Adobe Reader DC, the form may not be fully functional. Are you accessing the document on a phone or tablet? This document uses features available within Microsoft Windows (AES-256bit encryption) and may not work correctly using Apple or Android devices. Answer – open the document on a Windows PC (e.g. a friend, your local library or an Internet Cafe). Is your email address linked to Adobe? Note: hotmail is not compatible. We suggest using Gmail. First check your email drafts folder for the expected generated email. If it is there, click send, you will receive the activation code in an email back which will arrive to your inbox folder. If you wish to add your email >Add account-> Add gmail->(enter your gmail address)->Click your gmail address in the box and the Make default button->a tick should appear beside the gmail address in the box->click ok.
Click allow, enable and yes to all. You may be asked to enter your gmail address and password again. The pdf will create a draft email in your gmail email. In return you will receive an email with the activation code in it/confirmation email. Select the top option if you use Microsoft Outlook and this is your PC. Select the bottom option to access your web account e.g. Gmail, Hotmail, Eircom, etc. Gmail, for example, will ask you for your permission to proceed. Click “Allow”. Once you reply “Yes” to this prompt, an email will be automatically created in your Gmail account (you may be asked for a password) and you should click “Send” (see below). Please be patient during these steps because it can take a few minutes depending on the speed of your PC and the Internet connection. 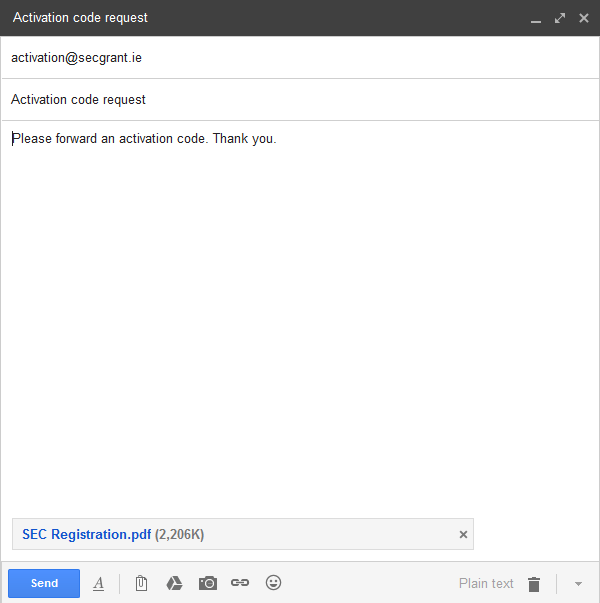 What will happen when I send the activation email? Answer – a response will be received to your email address within a few minutes containing a six-digit code. Enter the code, click on the first entry field and you will be able to complete the form. A message appeared about my webmail but nothing else has happened. What do I do now? A draft email has been created in your default email folder. Answer – Check the taskbar, at the bottom of the screen, to see if there is an option waiting for your input. Use the browser that you would normally use, unless the browser is Microsoft Edge, which is not compatible with Adobe. Applicants must have registered before the closing date of 30th November 2018. I received an SEC grant last year, do I have to re-apply this year? Yes, you must make an application for the 2019/20 school year even if you received a grant for the previous school year. How do I find my Eircode? Go to the Eircode site, enter your postal address and your code will be displayed. Salutation is how you would like to be addressed in letters and emails, e.g Dear Mr & Mrs Smith, Dear Nicole etc. 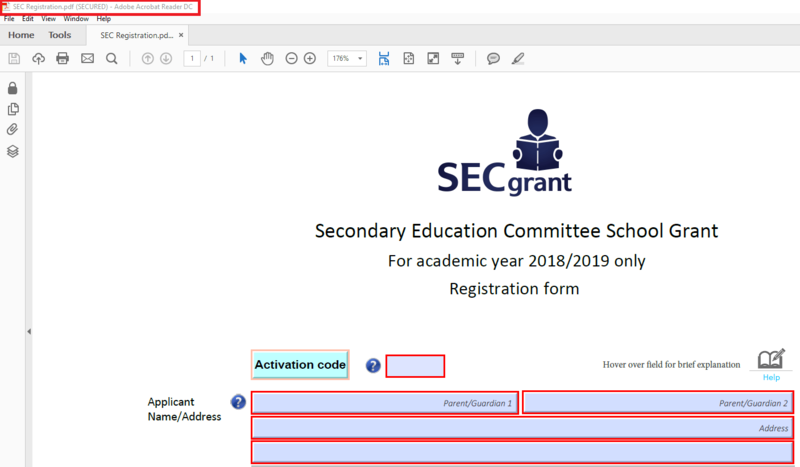 What schools are included in the SEC Grant scheme? Go to this page to see the list of secondary schools included in the SEC Grant scheme. Whose contact details should I include on the form? Include the contact details for the parent/guardian who is to receive all communications regarding the SEC grant application. Use the email address that you would normally use unless it is a Hotmail account which is not compatible with Adobe. We recommend that you use a Gmail account. What level do I put in for my child? Enter the level they will be at for school year 2019/20 e.g if they are entering first year in 2019/20, then select “Form 1”. Should I include all my children on the registration form? Include all dependent children on the form. See FAQ above for details of what is a dependent child. 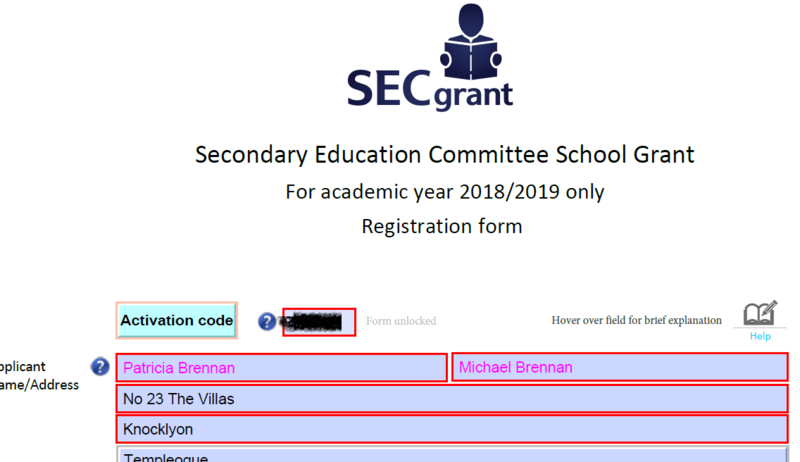 One of my children goes to a secondary school which is not eligible for a SEC grant, how do I include them on the form? Include them as normal, but for secondary school they are attending select the “Other” option. ever. The most effective solution is to assign security parameters that are an integral part of the document itself. easy-to-use document-security capabilities that encourage users to keep information private. Our solutions are based on the most current versions of Adobe Acrobat Pro and Adobe Reader DC. I am still having a problem on my PC. What do I do? What do I enter in the Application form? What internet browser and computer set up should I use? Security of your personal data is very important and the system is designed with the highest security available presently. You will need to use a laptop or a PC that is running Windows 7 or later. Older operating systems such as XP or Vista will not be compatible with current security standards. Use the browser that you would normally use unless the browser is Microsoft Edge, which is not compatible with Adobe. Similar to the registration submission you will need to have Adobe Acrobat Reader DC and not any other version of Adobe. Other versions may allow you complete the application and send it but the content will not go through and the application will need to be completed again using Adobe Acrobat Reader DC. Gmail accounts work well with Adobe but some email addresses conflict with it and can cause difficulties e.g. Hotmail, Yahoo. You will need to use a Windows PC or laptop preferably with Windows 7 or later. Apple Macs can also be used but may need settings to be amended to do so. Tablets and phones do not support the level of security that the application system runs on and cannot be used to apply for the grant. All boxes surrounded with red are mandatory and must be completed to allow the form be verified. This allows the Submit button to appear. Have the religion verification section signed by the Clergy/Minister in the child’s church. Attach the verification documents and post to the address on the back of the application form by 15th February 2019. What are the activation code boxes for? The Activation Code establishes a secure link between your email address and the SEC. 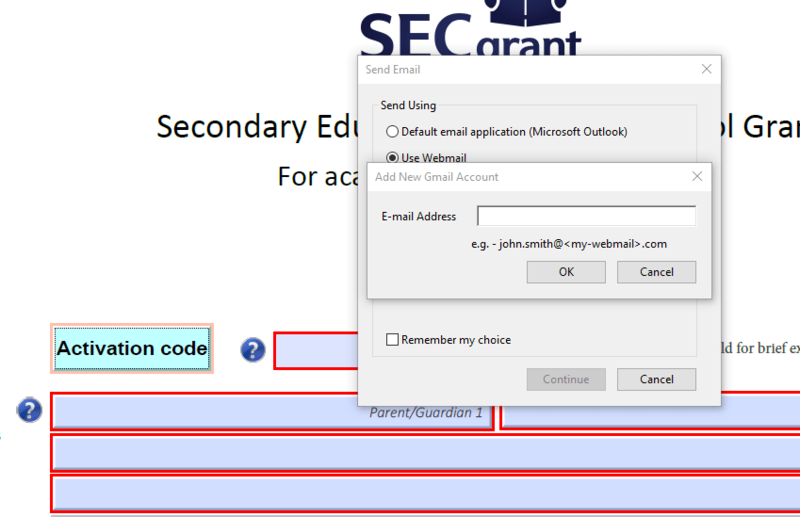 Click on the box and your email account will draft an email to send to SEC so that you can prove that when you have completed the application it can be emailed to us. Click all continue and allow commands in the popup screens selecting the email you are using and when the draft appears, hit the send button. You will receive a reply within a minute or so with the activation code for you to enter in the blank box. Then click outside the box and the application will be unlocked for you to complete it. 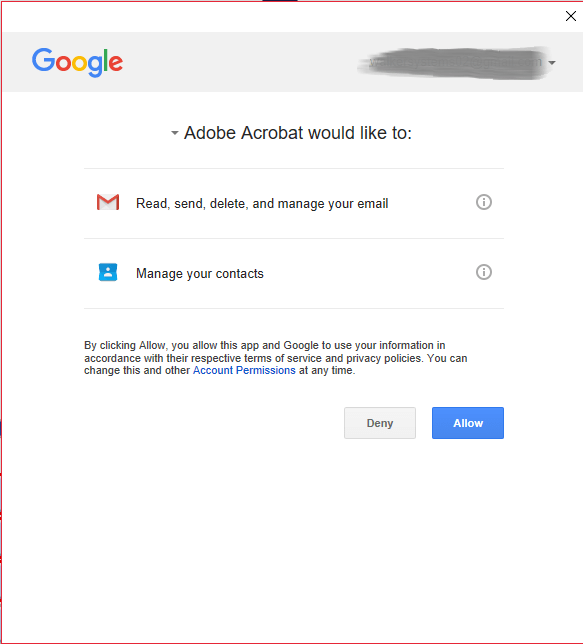 Use the email address that you would normally use, unless it is a Hotmail account which is not compatible with Adobe Acrobat Reader DC. We recommend that you use a Gmail account. Section A: What are the initials and months schedule at the top of the application? These are the children for whom you are applying for a grant. Their month of birth is beside the initials of each child for you to identify them and enter the child’s religion. You should have included all of your dependent children on the 2019/20 Registration Form. 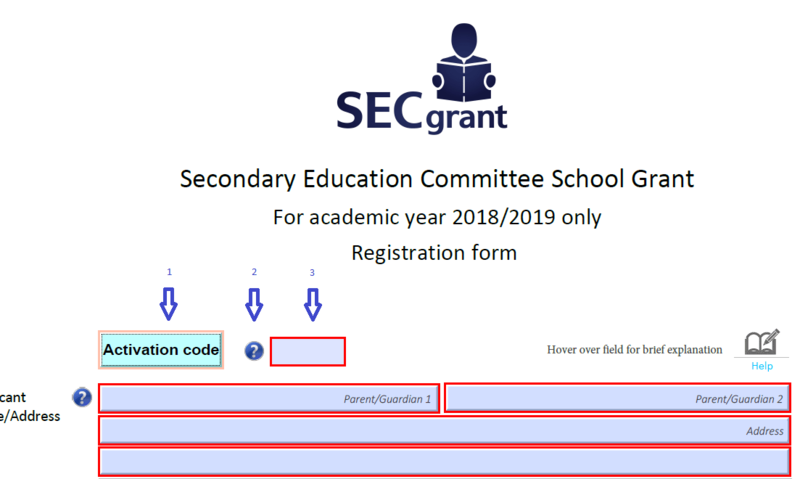 The SEC has a record of all the children you entered on your 2019/20 Registration Form. Select the status from the drop down boxes that is nearest to your present employment status. If you expect a change of employment status in the near future e.g. redundancy please insert a comment in the comment line provided at the bottom of the section. I was employed in 2017 but I am unemployed now, what should I put for employment status? Please include your current employment status on the form, e.g. Employments, unemployed etc. Employer name -enter the name of your employer here and if you are self-employed simply type in “self” or the trade name you use. Company Director – If you are a company Director and you own 50% of the shares in the company either on your own or jointly with your spouse/partner you will need to send in the most recent full set of audited accounts when you get to print the application to sign and post in to the SEC. Religious Denomination – please insert your own denomination by selecting from the drop down options or typing in the name of your church. If your church is not on the drop down list you may still be eligible, although the church must be a recognised protestant church by the SEC. Marital Status – I live in Ireland with my children but my husband/wife lives abroad. What do I enter for my marital status? Married – Geographical separation is not a marital status. 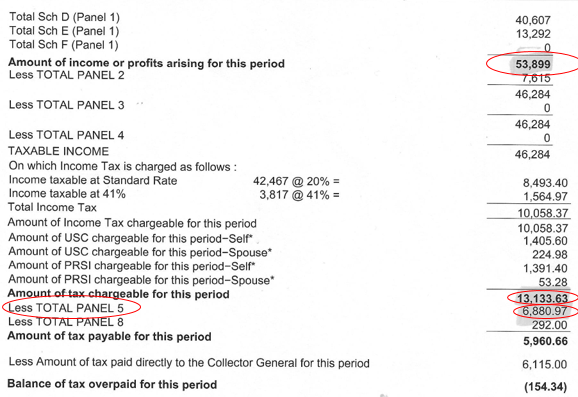 Family Income Details: What period do I include for the questions in this section? 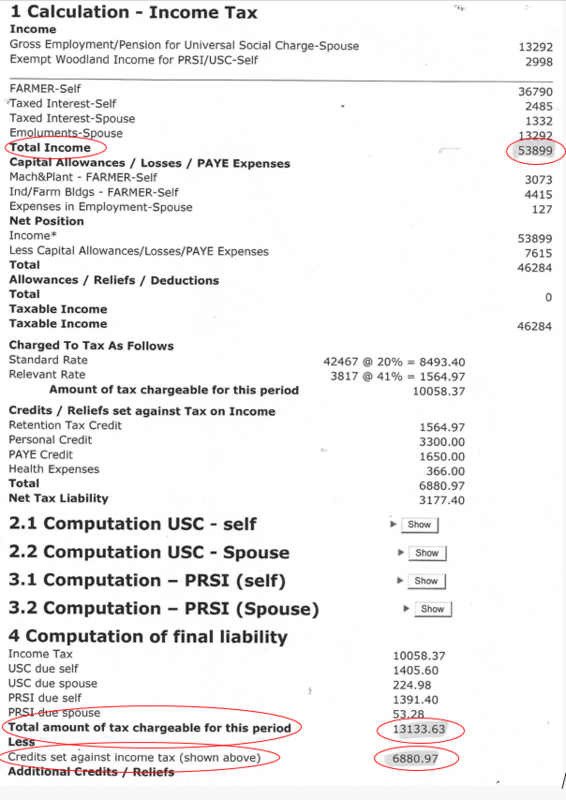 Even if you are self-assessed and your partner is PAYE you select the option above from the drop down options. My partner and I are jointly assessed for tax under the PAYE system. Where do I find the numbers to insert in the boxes? 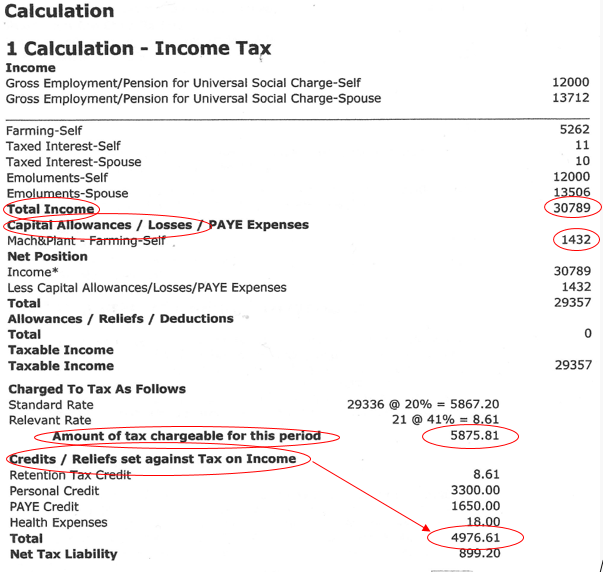 My partner and I are jointly self-assessed where do we get the figures to put in on the application at Section C? 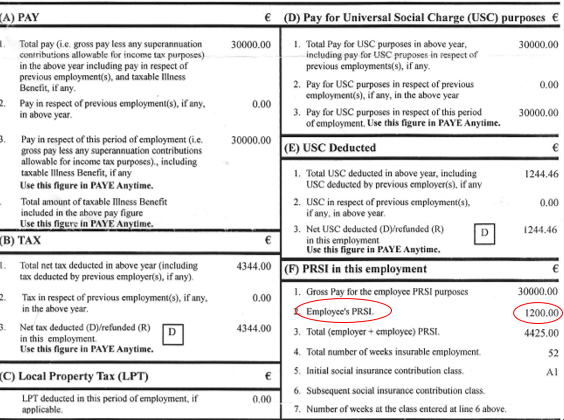 Our only income is from the Department of Social Protection. What do we enter for the Income section C? Select option from the drop down options for Income taxed based on box. Then scroll down the application to the section headed: and select the options from the dropdown list that matches the categories of payments you received in 2017 and insert the total amount received. We do not receive enough income from employment or social welfare to allow us pay the living costs for our family and the shortfall in the SEC Grant we received last year and the cost of the fees for the secondary school our children are attending. We rely on assistance from family to be able to meet all our bills. How do we put this into the application? Scroll down section C to the heading and select from the drop down list and insert the amount received in 2017. We live in a house that is provided as part of my employment and we also have a house that we rent out that we intend to move into on our retirement. How do I enter these details on the application? Firstly in Section D go to the first line of boxes headed and select from the drop down list. Then in Section E enter the details of the house you own but don’t live in and is rented out. If it is not rented out insert €0.01 in the rental box. We inherited my wife’s parents’ farm 15 years ago and we bought additional land 10 years ago to improve its viability and we still owe money to the bank for this extra land. How do we enter this on the application? 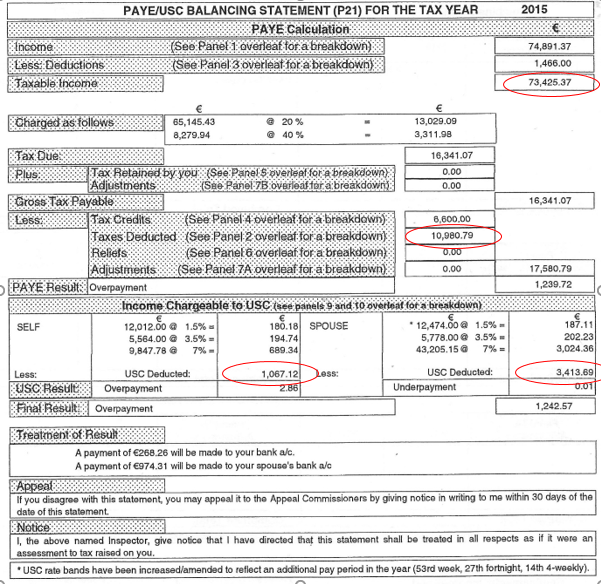 In Section D under the heading enter the option “owned by us with a mortgage” and complete the details as requested showing the full estimated current value of the entire farm and the current balance of the loan outstanding. We used to live in England and when we returned to Ireland we decided to keep the house we owned in England and we are renting it out to supplement our income from employment. Do we enter this into the property asset section of section E? Yes. Type in “House” for the asset type box and convert the Sterling £ values and rental income into euro € by dividing the sterling amount by 0.9. We inherited a house that we rent out and have never had it valued. Do we need to get an auctioneer to value it for Section E of the application? Not necessary if you can estimate it’s value by comparing it to other properties similar in the same area or referring to a newspaper property section or perhaps the LPT valuation adjusted up for a more realistic current value. Other Assets in Section E only has 6 boxes for us to enter our different savings accounts and shares. What do we do? Group the same type of asset and put the total figures for the asset type on one line. E.g. 3 bank savings accounts – total the amount invested and the current balances and insert them on one line. Similarly insert the year that is the average of the 3 for when invested. Do I include all mortgage/rent payments on the form? Only include the rent/mortgage payments for the home that you live in. We run a small shop and have an overdraft for stock in the shop. Do we enter this in Section F? No. Only personal borrowings for personal use are to be entered here. I have a long-term illness card for a condition that I have and all medicines are paid for using this card. However, I have to visit a consultant 4 times a year and it costs me €130 for each visit. Should I include the cost of the 4 visits I had in 2017 as the financial impact of my special condition? If the cost of these visits is not covered by medical insurance or other source type in a short comment in Special Circumstances box and put in €520 in financial impact box at the bottom right. You will need to post in receipts with the printed application when you have emailed the completed application. Is this our religion or the religion of the children we are applying for a grant for? It is the children’s religion that needs to be verified here. We are Church of Ireland as our children are and we do not know the charity number for the Church. Where do we get it from? For Church of Ireland, Presbyterian, Methodist, and Society of Friends you do not need to enter the charity number as we know them already. Our family attend a Pentecostal Church. Do we have to insert the charity number as well as the name of the church? Yes please. Your Pastor or someone in church administration should be able to provide you with this number. What does the error message mean when I click Verify on the Application Form? Select None if the box does not apply to you. Once we have emailed the application have we completed the process to apply for a grant? No. You will need to print off the application after you emailed it and then sign it and have the verification of religion section signed. Then post it in as instructed on the back page with the verification documents relevant to your details you have inserted on the application.